It is hard to believe that we have been here over two years. Yet, when I look around the yard, I see that all our hard work is paying off. We have a beautiful lawn, the additional second deck, ornamental trees now planted lending some color to the dense firs and deciduous trees surrounding us. This year, the Pres has chosen to enlarge the original patio, making it triple it's original size. It will soon be the entire length of the house as well as another 2' wider. 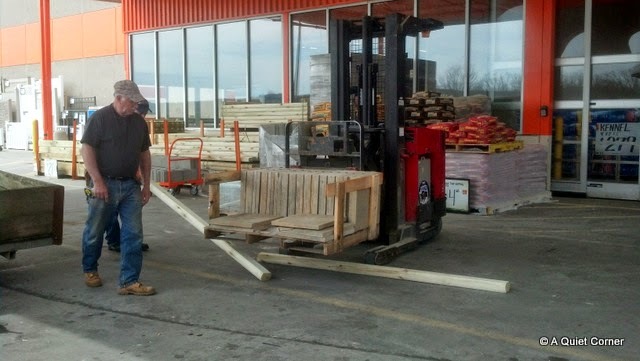 Off to Home Depot we went to pick-up the patio blocks he ordered last week. Although I was concerned about the close to 4,000 lb weight, the Pres didn't blink an eye. He knew between the truck and the trailer, we would have no problems. After he assured me the weight would be fine and while he was overseeing the loading, I ran into the garden center and bought a small Lilac. It only weighed about 25 pounds so I didn't feel like I was exceeding the load limit with it...LOL...that's what I told the Pres anyway...:)..."It's only a little one, Honey." Once home we planted our new Lilac, gave it a drink and then it was time to unload the stacks of patio blocks. Good thing we have friends in the right places at the right time!! Glad to see you are supporting Home Depot. After retiring from teaching they have provided Hubs with a part time job, which has kept him from driving me nuts. All that hard work will be worth it. Nice fence, too. Seems lots of work ahead for the Pres but you are so fortunate to have such a lovely home. I would love a lilac tree but I think Perth is far too hot to grow that type of plants, more's the pity. Two years! It doesn't feel that long at all. The people who bought your house here revamped the garden this spring. It's HUGE now. They added a trellis with flowers and raised beds. It looks nice. They also have chickens and ducks in the backyard. And bees! This story made me think of a famous TV advertisement in Australia: A pick-up truck is being completely filled with beer by a group of man - one of the men puts a bottle of sherry on the back "for the ladies' - at this point the pick-truck collapses and one of the other men says "I think you over did on the sherry there, John!" - classic dry humour! You've got yourself an energetic guy there. You'll enjoy the extra outdoor living space. What a project laying ahead!! Reading Stewart's comment as I type and laughing. Beautiful home... fantastic setting and is that your little dog in the photo? I'll bet he/she is supervising this entire project. Nice! In my experience, keeping a home up is a never ending project. So many things to do. Great you had friends to help! What a beautiful and wonderful place to call home! is that o.s.? :) nice help! such a pretty place you have. thanks for linking up! The rock wall under the wooden pickets is very impressive. Your home and landscape look lovely. Nice fencing and stone wall. - I bet you will enjoy that Lilac once it gets bigger and blooms. They are very fragrant. Your hubby looks to be very busy with the patio work. I love your house and property! It is beautiful. It would be fun to landscape it. I love lilacs too and would love to plant one in our yard. Have a great day. This is very, very exciting!!! Will he do it all by himself? Also,we have a lilac bush right outside our kitchen door, it smells wonderful in the spring when I am cooking and doing things. I hope you will be posting the progress. i wish the hubby & i could get on the same page ... i want to work on the yard, he wants to work on something totally different. then when he finally gets to wanting to work on the yard, i have no interest. what??! That is a big project! Can't wait to see what it looks like when it's all finished. And the blooms on the lilac, of course! when I read weights and measures the first thing I thought of was the govt agency that comes in and tests all our scales to make sure they are accurate. He must have a good back if he's going to be putting all of those down by himself! I hope your lilac does well. I remember them growing up in NJ. Our neighbors had a whole row of them and my sister was allergic! They sure were beautiful when they bloomed, but not to her. I can't wait to see your patio. We enlarges ours too..and I love it. I sort of wish we had thought to make it the full length of the house..but it can still be done. Right now..it's nice. pushed it out another five feet..you are going to love all that room. I didn't get to plant a single extra plant this year. Too much going on health wise..but next year will be different. :) By this time next year..your "little" bush will be..gorgeous! JP, you have a lovely home and yard. Beautiful fence shots. Have a happy weekend!